The hubbie and I decided to take his parents here after a day spent in Mishawaka. We had first stopped here back in 2012 and decided this would be a good choice for us and his parents & to re-fresh our opinion. 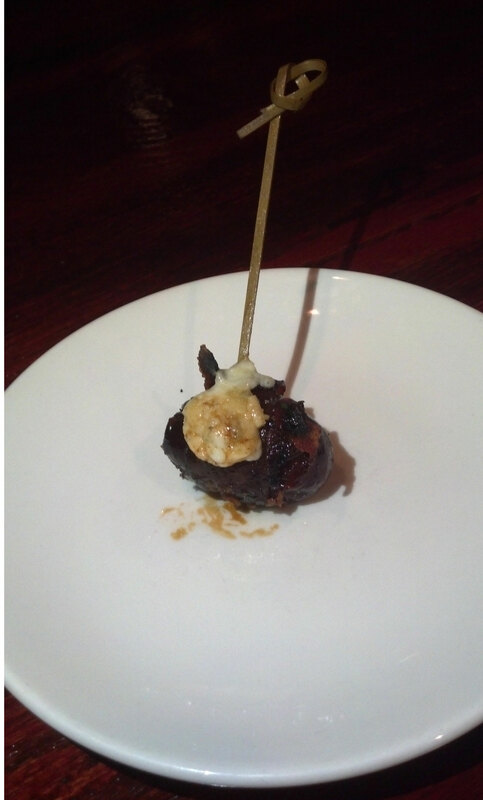 One of the 4 dates that came in the Medjool date appetizer. Disappointing is a polite way to describe our visit. We started by ordering the Medjool date appetizer. Described as stuffed dates with smoked almond, blue cheese, an aged basalmic reduction & wrapped in Nueske bacon, they sounded great. What we got was 4 pieces of stuffed Medjool dates. Sure they were wrapped in bacon but each date was no more than 1″ in length. 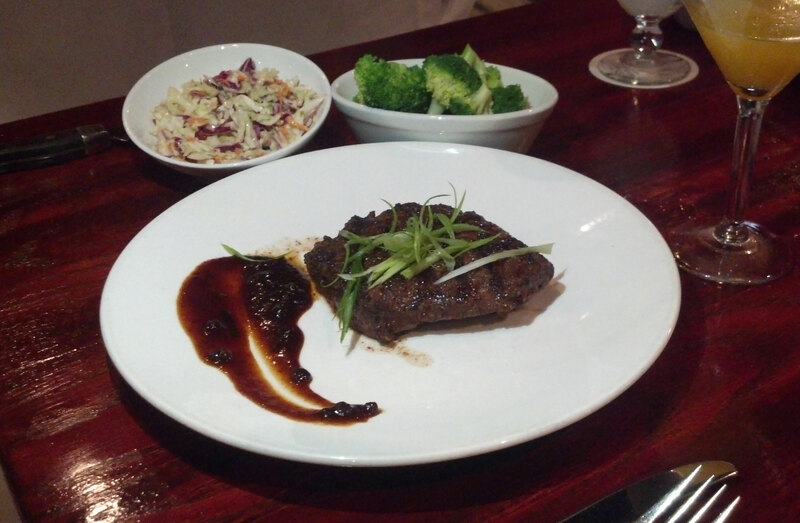 At $9 this was $2.25 per date – a pricey amuse bouche for our party of 4. And where was the smoked almond? was it hidden in the date, or supposed to appear as crushed almond pieces on top? The Corndance salad we ordered had wilted lettuce pieces and was swimming in a pool of salad dressing. Yes there was balsamic in the dressing, but that was all that we tasted. Kitchen coordination also fell flat in terms of dish presentation and composition. The roast chicken dish that my mother-in-law got (pollo rico) was described as an inca spiced rotisserie chicken, accompanied by wood roasted garlic steak fries, and a vegetable medley. What showed up was half a roasted chicken on top of 4 (we counted them – only 4!) french fries in a pool of au jus – no side veggies. Note the lack of onions or garlic fries - just a lonely steak w/ a smear of BBQ sauce. The flat iron steak dish listed on the specials menu sounded great – a dry aged steak with truffle oil, sautéed pearl onions and wood roasted garlic steak fries . I was told I got to choose 2 side dishes, which I thought odd for a special but did not turn this opportunity down. When I got my plate, the only items present were a lonely steak topped with some julienned green onion, next to a smear of chipotle BBQ sauce. No sign of the truffle oil, onions or fries that drew me to order this dish – just a bare spot where these items should have been. The coleslaw and broccoli that I choose as my 2 sides also fell flat – large pieces of flavorless cabbage and broccoli that still tasted raw with no salt or seasoning. When we got the bill, we figured out what had happened – our waitress did not realize I had ordered the flatiron steak special, but assumed I was ordering the regular flatiron steak offered under their steak menu. So we weren’t charged the price of the special version – a small saving grace – but our impressions of the steak weren’t that great either. Since Corndance touts a rotating seasonal menu, this is a big faux pas in the restaurant’s level of customer service training for their wait staff. Our waitress should have known what specials were being offered that night, and should have asked if I was ordering the regular flatiron steak or the flatiron special. Service was also lacking – while we understand going to a restaurant on a Saturday evening on a busy road near a major shopping area can result in slow service, we had to wait a significant amount of time for our waitress to take our order. And this was before our dining area was full, and before a large party got seated next to us. While I am all for supporting local businesses, these multiple gross oversights were inexcusable. The fact that the kitchen staff was blatantly sloppy or intentionally skimping entree components is an affront to the customer, as the menu pricing is supposed to reflect a higher level of food preparation and the locally sourced ingredients. Corndance touts a rotating seasonal menu, so our waitress should also have known what specials were being offered that night and should have confirmed if I was ordering the regular flatiron steak or the flatiron special. Not catching this tells me that the restaurant is not setting aside time to prep/educate their wait staff on what is actually being offered that day. What made our experience worse is that the owners boast of their experience working in various Chicago restaurants before opening 4 businesses (including this one) in Indiana. I understand that Northern Indiana is not known for high-end restaurants. But that doesn’t give a restaurant an excuse to dumb down their level of service for a perceived lower clientele expectation. The local private Catholic university brings in lots of high-dollar spenders during the football season, so we do see a fair amount of educated out-of-town diners in this area. And our proximity to Chicago brings that population to our area during the tourist season. A restaurant should never assume that diners will tolerate a lower level of customer service or food quality & presentation because of their geographical location. What matters at the end of the day – a dedication to delivering well-prepared food and good customer service, no matter whether you are a Michelin-rated restaurant serving 5 course menus or a simple mom & pop restaurant offering local specialities. Unfortunately, our 2 visits to Corndance have shown that they are not able to consistently deliver in either area. We won’t be going back. I decided to try Simply Southern based on the rave reviews on Yelp – very reasonable cost, great selection of traditional Southern comfort food. 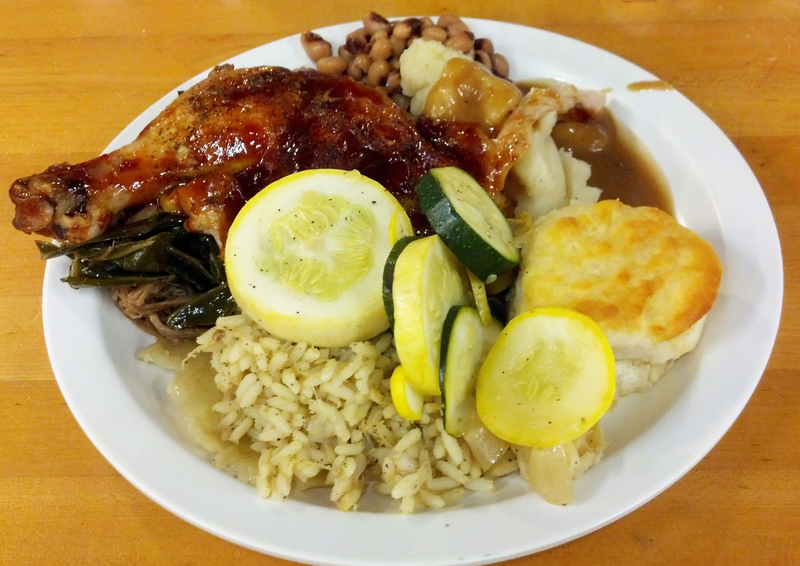 Simply Southern is a no-frills Southern buffet restaurant – you pay for your dinner, pick up a plate, silverware and a cup & walk down the cafeteria buffet line, adding helpings of the various offerings that catch your fancy. 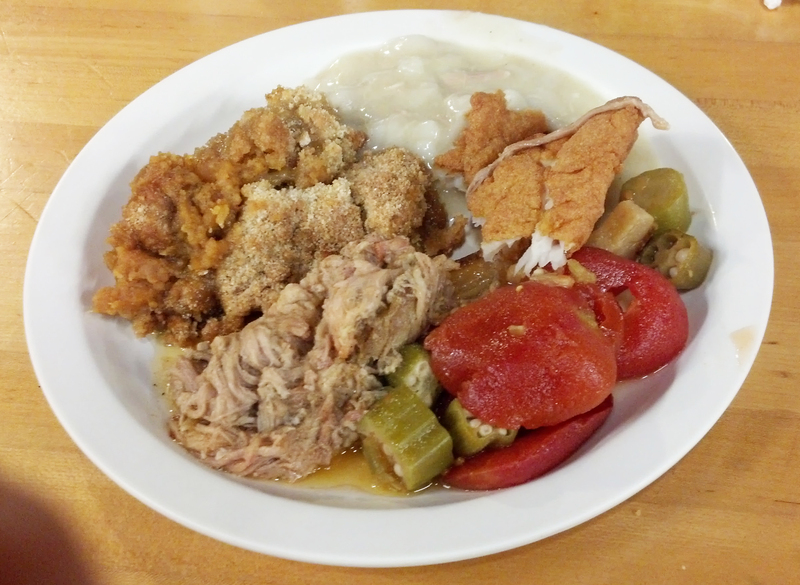 There were all the traditional Southern side dishes – black eye peas, collard greens, corn, lima beans, squash, okra & tomatoes, fluffy southern biscuits, brown and red gravy, plain and vinegared pulled pork, barbeque and fried chicken, fried fish and chicken bog. For dessert, there was banana pudding, sweet potato souffle, peach cobbler and other various fruits. Since it was after 5pm, macaroni and cheese and ribs were also supposed to be available. During our dinner, the busboy (Isaac) kept the tables clean and serenaded the diners by breaking out into gospel song. It was obvious from his level of enthusiasm and high energy that this was a man who took pride in and enjoyed his job, contributing to the Southern friendliness/charm of this humble home-style restaurant. This is the place to go if you’re looking for simple Southern food in a casual family setting. Round 1 : Barbeque chicken, squash on top of chicken bog, black eye peas, collard greens, mashed potatoes with brown gravy and a fluffy Southern biscuit. Round 2 : Sweet potato souffle, okra & tomatoes, fried fish, chicken & dumplings. 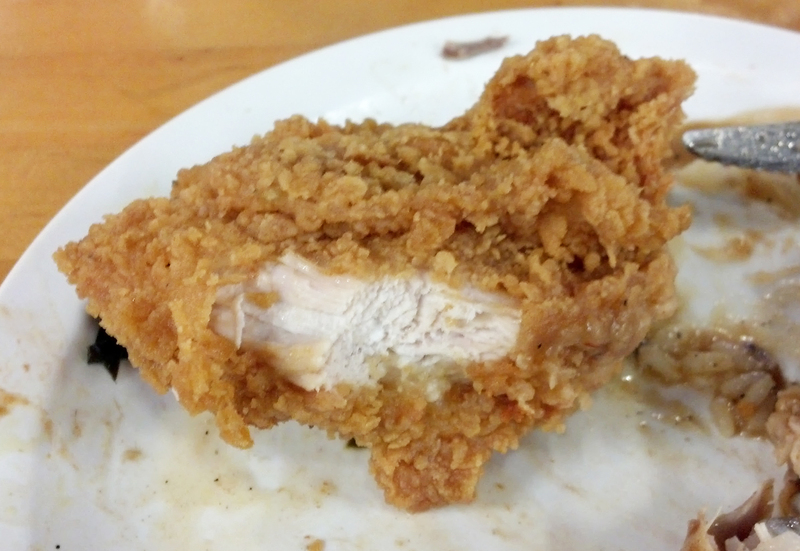 Perfectly cooked fried chicken fresh from the frier that my co-worker nabbed as they were re-filling the buffet line. 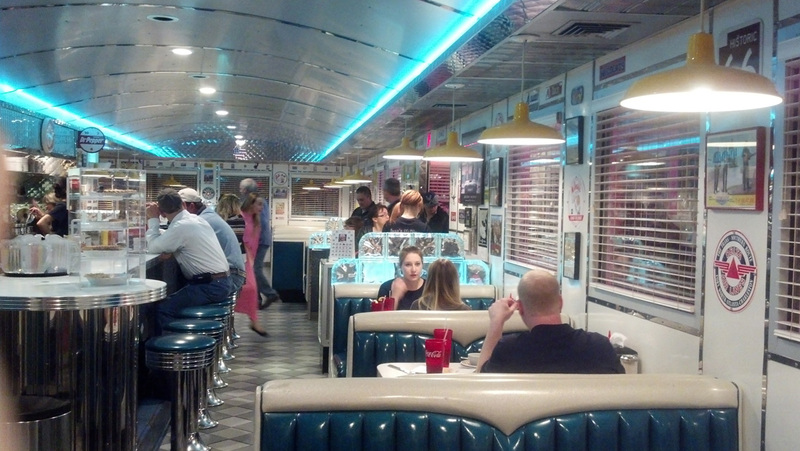 Craving simple American sandwich food, my co-worker and I headed to Papa’s 50′s Diner while working in Sierra Vista. Rebooted after the current owners purchased & re-opened the place back in 2011, this 50′s era neon-adorned diner sticks out among the scrub and brush of the Sierra Vista landscape. The 50′s decor continues inside, with the counter and booth seats covered in sparkly blue vinyl, blue neon lighting on the ceiling, metal hanging lamps above each table and 50′s era metal signs decorating the walls. Like any diner, there is the obligatory pie case (a small one sitting on the counter) with several fruit and cream pies. Since this is a diner, I decided to get breakfast for dinner. 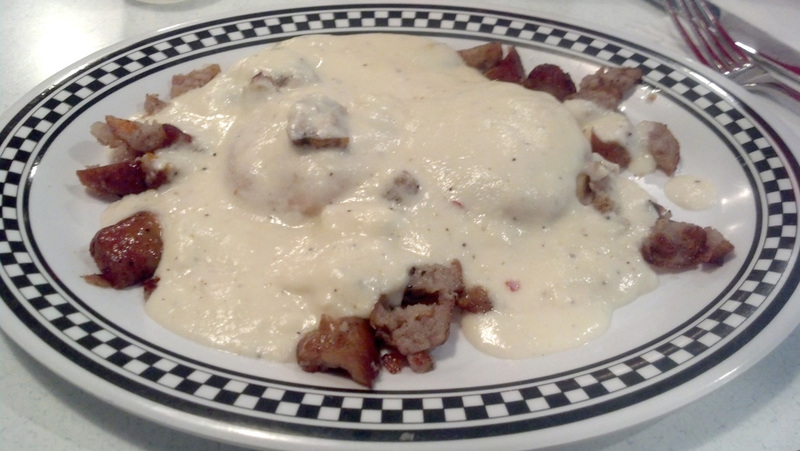 I ordered the Papa’s combo, which is a 3 egg cheese omelet with hash browns & a side order of biscuits and sausage gravy. 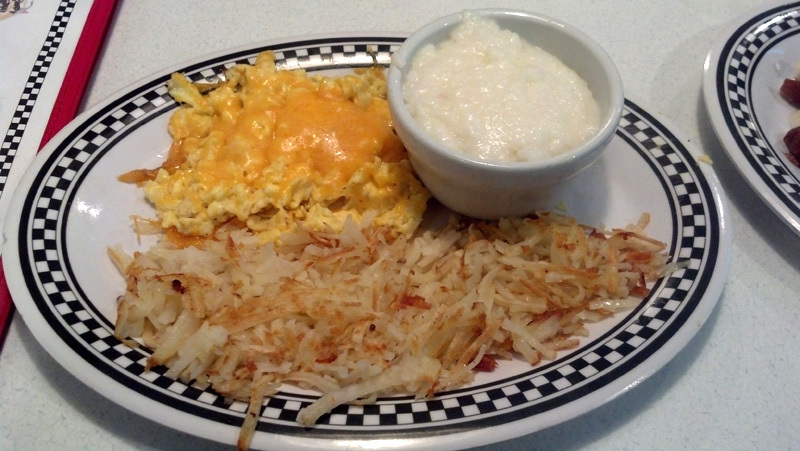 Instead of the omelet I subbed scrambled eggs & also opted for a side cup of grits. Like any good diner, the food was not gourmet level. The biscuits with sausage gravy actually used a white flour gravy with pieces of pork breakfast sausage sprinkled all over the covered biscuits, unfortunately not a true sausage gravy. But, the sausage was very tasty and the gravy had a good consistency. The biscuits were not the light cake-like Southern biscuit, but were reminiscent of smaller Northern biscuits and slightly dense. My eggs were scrambled a little on the firm side. And mirroring the hyper sodium awareness trend, no salt in my eggs or grits. While the food was the expected standard diner quality, what made it was the service. Kathy, a new waitress, made several checks to confirm specifics of our dishes after taking our order. She was genuinely wanting to make sure that we had a good dining experience – contrary to some the negative service reviews that some people had cited. So if you’re craving that 50′s diner experience in southwestern Arizona, stop by Papa’s 50′s Diner for a trip down nostalgia lane.